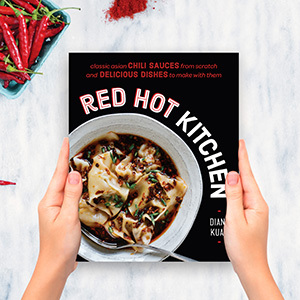 My cookbook is officially released next week! And it makes me wonder: where did the time go? It seems like just yesterday I handed in my final manuscript, and now all of a sudden December 11th is just around the corner. There are still interviews to schedule, books to ship off, and a book launch party to plan. It's equal amounts exciting and nerve-racking. Sometimes I just want to take a deep breath and pour myself a large glass of wine. Other times I just want to escape to the kitchen and de-stress by cooking. So it's ironic that the dish I chose to cook today is also a Chinese-American comfort food classic, like the dishes in The Chinese Takeout Cookbook (which does have a recipe for sweet and sour pork). I hadn't made crispy chicken in months, but just felt like doing it again today on a whim. This recipe is a bit more challenging than some easier chicken recipes on this site like Kung Pao Chicken or Spicy Cashew Chicken. But it's a great bet if you really want to try making this classic takeout dish at home, or if you just want to lose yourself in the cooking process for 30 or 40 minutes. The latter reason worked great for me tonight. But I'll still be having that glass of wine with dinner. 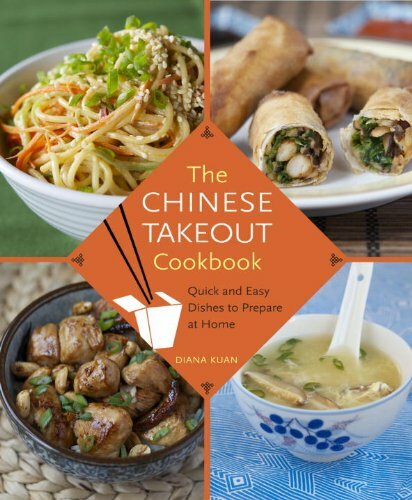 Check out my new cookbook The Chinese Takeout Cookbook: Quick and Easy Dishes to Prepare at Home for over 80 more Chinese restaurant favorites! Coat the chicken: Mix the egg whites with the salt. Coat the chicken in the egg white mixture. In a large bowl or deep plate, toss the marinated chicken in the cornstarch and shake off any excess before frying. Transfer the oil to a heat-proof container. (It will take about 1 hour to fully cool, after which you can transfer it to a container with a tight lid to dispose of it.) If you used a wok to deep-fry, you can reuse it to stir-fry the chicken next by just wiping down the insides with a paper towel (carefully, as the wok is still very hot.) If you used a pot for deep-frying, switch to a clean work or large skillet for stir-frying. Heat the remaining 1 tablespoon of oil in the wok or skillet over medium-high heat. Add the garlic and ginger and stir-fry until just aromatic, about 20 seconds. Add the pineapple and the sauce and stir to coat. Let the sauce simmer for about 2 minutes to allow the pineapple to become tender. Return the chicken to the pan and toss until well-coated with the sauce. Transfer to a plate, sprinkle the optional sesame seeds on top, and serve.